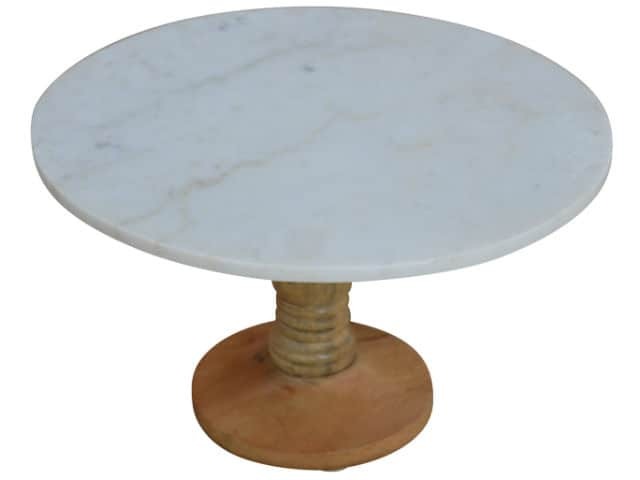 This Round Cake Stand 30cm has a beautiful marble top on a 100% solid mango wood base. It features a strong pedestal, large base and smooth design. It is the perfect way of displaying a selection of cakes in a simple yet glamorous way. Use for events and occasions such as weddings, dinner parties and family gatherings. Packed and shipped one per box. Weights and dimensions might vary from the given specifications. Skilled artisans hand craft these using 100% solid fruit wood with no veneers or laminations whatsoever. Thus, any grain patterns, knots, minor movements or variations are inherent in hand-crafted items. Delivery of this item is only available to Mainland UK.